It's a truth universally acknowledged that in the news media one missing white girl equals half a dozen dead black girls or 100 dead Muslims or 1,000 Africans with AIDS. The missing white girl will always get front-page coverage while death and disease striking men and women of color will be relegated to the inside pages, below the fold. Wikipedia even has an entry for it: Missing white woman syndrome. It's a sad fact that this rule applies also to American oil spills. While everyone is now aware of the massive leak off the coast of Louisiana, in the Gulf of Mexico, only now is the U.S. news media beginning to notice in print the 50 years of environmental devastation inflicted in Nigeria. According to the Times story, oil spills equal to the Exxon Valdez spill have occurred every year for the past five decades. ''Small children swim in the polluted estuary here, fishermen take their skiffs out ever farther—there's nothing we can catch here,'' said Pius Doron, perched anxiously over his boat—and market women trudge through oily streams. Nigeria supplies 40 percent of all the crude oil imported by the United States. With over 600 oil fields, the Niger delta is the world capital of oil pollution. But the oil fields have taken a toll on local residents: There is little access to clean water; life expectancy has fallen to about 40 years over the past two generations. A U.N. Environmental Program study began systematic inspections of the Nigerian catastrophe in December 2009. The numbers were gloomy. The ''officially recorded'' oil spills between 1976 and 1998 came to over 2.5 million barrels of spilled into the Niger Delta ecosystem from extraction performed by oil companies including Shell, ExxonMobil, Total and Elf. These companies have taken profits while local communities live in the wasteland—including pollution caused by nonstop gas flaring—a sight kept far offshore in the current cleanup activity in the Gulf of Mexico. 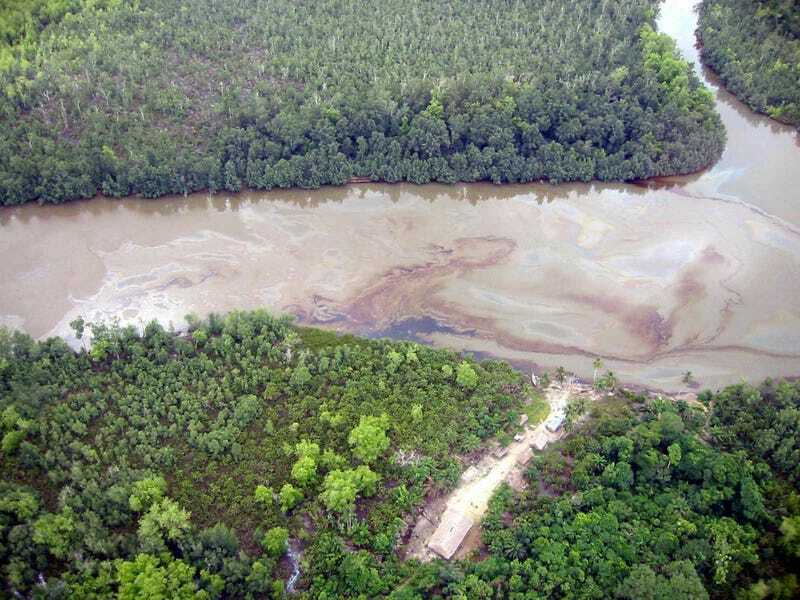 According to an equally devastating story in the Guardian just two weeks ago, on May 1, 2010, an Exxon-Mobile pipeline ruptured in Akwa-Ibom spilling more than a million gallons into the Niger Delta. While Nigeria's oil tragedy is a front-page story now, four years ago a study compiled by the World Wildlife Fund UK, the World Conservation Union and representatives from the Nigerian Conservation Foundation concluded that the Niger delta was one of the five most polluted spots on the planet. Nigeria is not the only African country that has suffered environmental devastation because of oil spills. The multinational oil company Trafigura was caught dumping tons of toxic oil waste in the Ivory Coast in 2006, sickening tens of thousands of West African men, women and children, and devastating swaths of the coast around Abidjan. Two dozen people died. The company has offered to pay around $45 million to the approximately 30,000 individuals who were affected. The company is currently facing trial for breaking Dutch import and export laws. While American protesters are focused on Alaska, the Chad-Cameroon Oil Pipeline project has been operational—and environmentally costly—for years. In 2007, a deadly spill in Kribi devastated local fishing grounds and villages, uprooting residents and disrupting the livelihood of thousands. None of this means that Americans should pay less attention to the ongoing devastation in the Gulf of Mexico—the analogous missing white girl. Far from it: We should pay more and closer attention to the material issues of extracting oil from wherever it exists—in Africa, in Alaska, deep underwater in the Gulf of Mexico. Can we bear the environmental risks of oil use? Can we continue to turn a blind eye to disruption in Nigeria and elsewhere now that we have seen the devastation firsthand off the coast of Louisiana, Alabama, Mississippi and Florida? Should photographs of oily birds on American beaches move readers more than thousands of acres of devastation across the globe? Political slogans help Americans evade the hard truths of oil production. Nobody who drives a gas-powered vehicle can honestly malign Sarah Palin's admittedly tone-deaf comment ''drill, baby, drill'' unless he or she is also an environmental engineer focused on safety regulations to ensure that disasters in Nigeria, Cameroon, the Ivory Coast, Alaska or the Gulf of Mexico do not continue to happen. Hollis Robbins is a professor of humanities at the Peabody Institute of the Johns Hopkins University and teaches African-American poetry and poetics at the Center for Africana Studies.